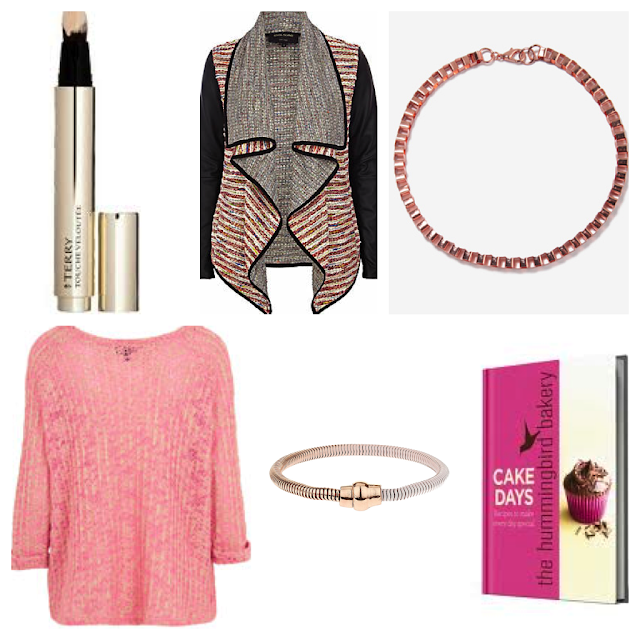 So its my second Weekly Wishlist post and this week I have been lusting after neon knitwear. My style mainly consists of skinny jeans and simple tees or cosy jumpers thrown on top. One of my favourite pieces from Topshop was this fluro jumper and its a reasonable price at £24. Something a little more structured is this River Island waterfall jacket, I love the neckline and it would be super easy to wear! Moving onto jewellery this Forever 21 necklace is such a bargain at £4.90, its a lovely rose gold colour and it would look amazing with a crisp white shirt or blouse. I have been on the lookout for some bracelets to wear with my Michael Kors watch which I got for Christmas (I know everyone got one! Ha) and this Miss Selfridge one fits the bill perfectly. Makeup wise I don't know why I still haven't purchased this By Terry Touche Veloutee concealer, I have still yet to find a great under eye highlighting concealer but this one is pretty expensive at £35. Lastly, I really want to get into baking (Or at least give it a try) and this Hummingbird Bakery book has some yummy recipes to choose from. Hope you enjoyed this weeks wishlist everyone, let me know whats on yours!